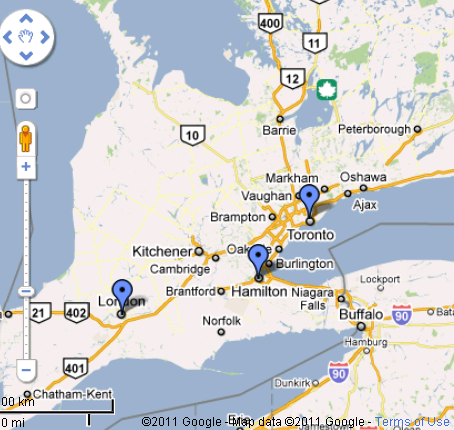 On February 1, 2011 I set off early by car from Toronto to kick off the Answering TTP Roadshow in London and Hamilton, Ontario. I arrived in London shortly before my scheduled morning meeting with Dr. Clark. Good thing I had some extra time, as it gave me the opportunity to stretch my legs during an unexpected tour of the facility in search of his office. Dr. Clark showed me the Apheresis department and introduced me to Eleonor, the Apheresis nurse on duty. I was impressed by their general concern for their TTP patients, interest in the patient organization and willingness to support our initiatives. Dr. Clark also shared some ideas regarding plasma exchange treatment and his concern to ensure best practices are shared amongst TTP treatment centres. It is interesting to note that his centre has a significantly higher survival rate for TTP patients as compared to the norm. When I entered the Apheresis treatment area and saw the plasma exchange machines, I could not help but be reminded of the mixture of anxious and reassuring memories I carry with me as a result of my 47 past treatments. I recall the feeling of being cold to the bone, the itchiness of hives, the endless bags of plasma, the worry of serious reaction that may accompany the next bag of donor plasma and the rush of the Benadryl. These anxieties mix with the memory of the warmth of a holding hand, the calm that accompanies the smile of friendly faces, and of course the brainlessness of daytime TV that distracted me. All the treatment beds in this open concept treatment area at the London Health Sciences Centre were occupied by patients for various treatments. Of them, I recognized one patient undergoing the familiar plasma exchange TTP therapy. I resisted the urge to approach the TTP patient, but I wonder now if this was the correct decision. On one hand I feared invading a patient's privacy, but on the other hand I know that I always appreciated distraction from the treatments and the opportunity to meet someone who shared my diagnosis. In addition to leaving the facility copies of the new TTP patient brochure, I also left hard copy posters to publicize the April 20th Toronto Support Group & Info Session. Hopefully patients from the centre in London will be interested and able to attend the Toronto session to garner ideas to start up a local group. I had previously met with Dr. Arnold in Hamilton to access tests not available at my regular TTP treatment facility, Saint Michael's Hospital in Toronto. I remain grateful to Dr. Arnold who accurately recommended that I refrain from traveling to my brother's wedding in Italy just prior to my last (3rd) relapse. One of my biggest worries is getting on an airplane without knowing that my body is in TTP crises. I can only surmise that the effects of changing pressure, associated with airplane travel, on the small blood clots could result in serious long term injury or death. Moreover, if you put me in a new treatment facility, you remove my only advantage garnered from relapsing; I know what to expect. Being in another country for treatment, especially where I do not speak the language, would remove the level of comfort I get from knowing the hospital routines and the familiar faces I have learned to trust at my home treatment centre. During this roadshow stop in Hamilton I met with the Hamilton Health Sciences Apheresis nurse, Sylvie, to discuss Answering TTP initiatives. I am grateful for her time, interest and feedback which will surely help streamline my presentation to medical staff going forward. We discussed the challenges associated with connecting patients due to privacy legislation and the potential influence of the Apheresis staff to spread the word to new patients about the existence of a national patient group. We agreed that feeling alone is one of the hardest aspects of a TTP diagnosis and knowing that you are not alone can go a long way to support new patients. As in London, I left new TTP patient brochures and posters to engage patients from Hamilton in Answering TTP initiatives including the April 20th Toronto Support Group & Info Session. Overall this kickoff to the Canada Roadshow left me feeling reinvigorated to the cause. Pulling onto the highway heading back to Toronto I felt positive that we will have the support of Apheresis treatment centres to help connect the TTP community. The medical staff will recognize the value of our platform aimed to support patients, raise funds for research and education. This is the beginning of something big. Next Leg of the Trip: Week of Rare Diseases Day Western Canada Roadshow. Follow this blog for updates.